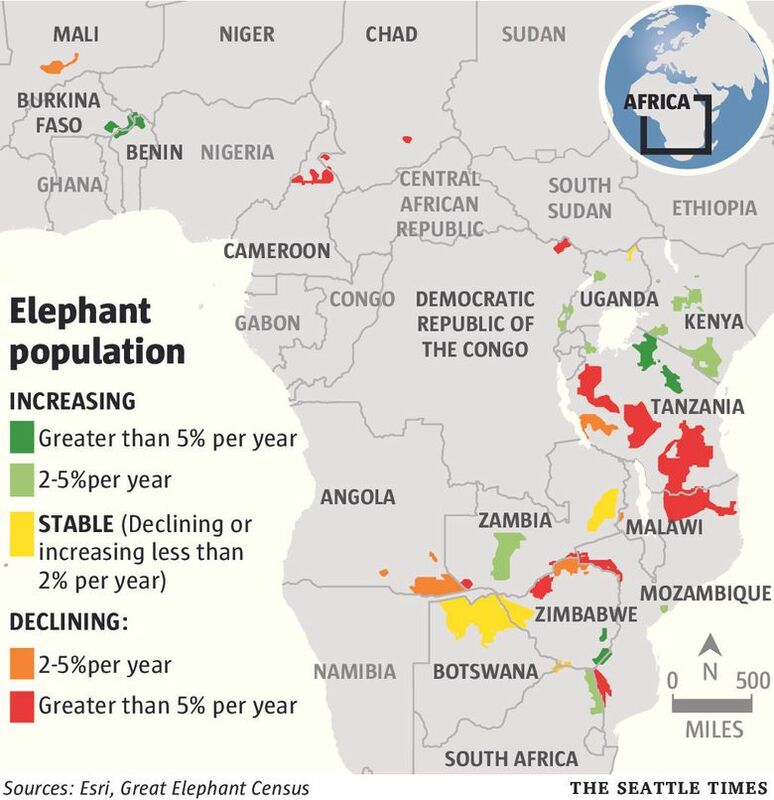 An African elephant census financed by Seattle’s Paul Allen has found that populations fell by 30 percent in seven years. But there were some bright spots where animal numbers were on the rise. In countries where profits from ivory poaching can pass through many hands — including criminal gangs, sham businesses and government officials — it has long been easy to turn a blind eye to signs that elephant populations are in trouble. For one thing, much of the data wasn’t solid. 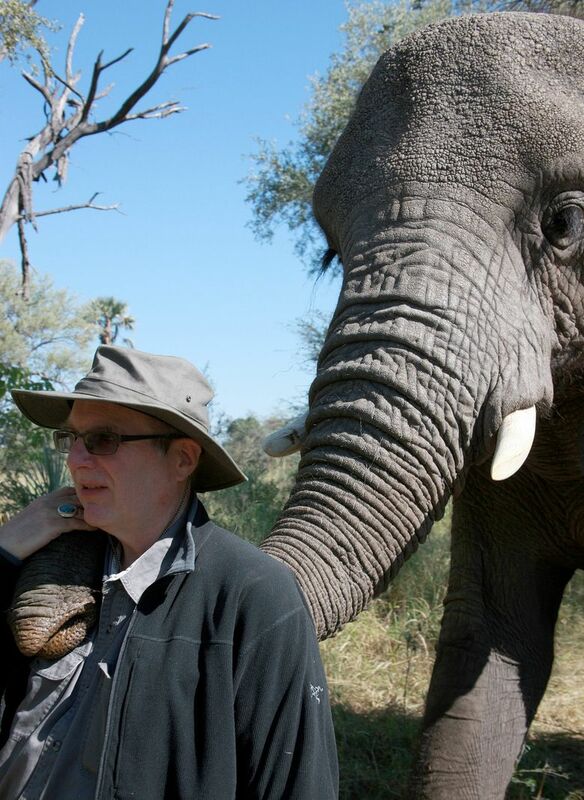 So Microsoft co-founder and philanthropist Paul Allen set out to fill that gap by funding the most comprehensive survey conducted of African elephants. Allen’s Great Elephant Census found that African elephant populations fell by 30 percent between 2007 and 2014. Some of the most precipitous losses occurred in Tanzania and Mozambique, where the census documented a “catastrophic decline” of up to 60 percent, Deutsch said. In northern Cameroon, surveyors counted more dead elephants, many slaughtered for their tusks, than live animals. 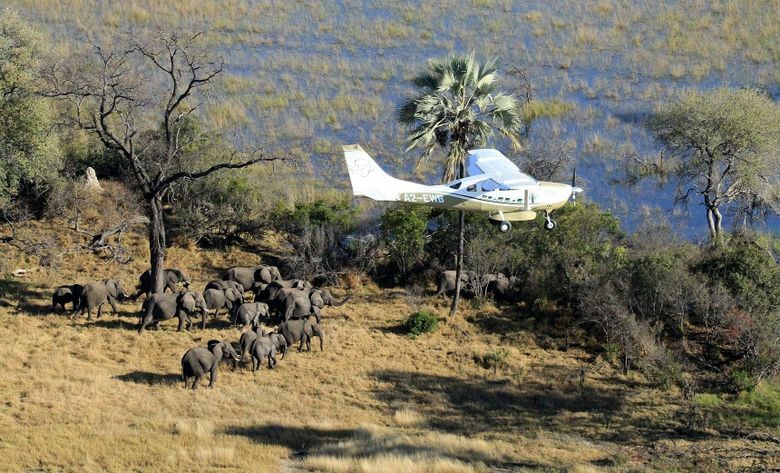 A team that included 90 researchers from governments and conservation groups collectively flew 288,000 miles of aerial surveys — the equivalent of circling the globe almost a dozen times. They covered 18 countries, focusing on the national parks, refuges and range lands that are home to 93 percent of savanna elephants. The census estimated Africa’s elephant population at about 375,000 — down by 144,000 since 2007. Even in protected areas, researchers found many carcasses of elephants killed by poachers. But the survey also uncovered some bright spots. Elephant numbers in Uganda more than quadrupled since the late 1980s. 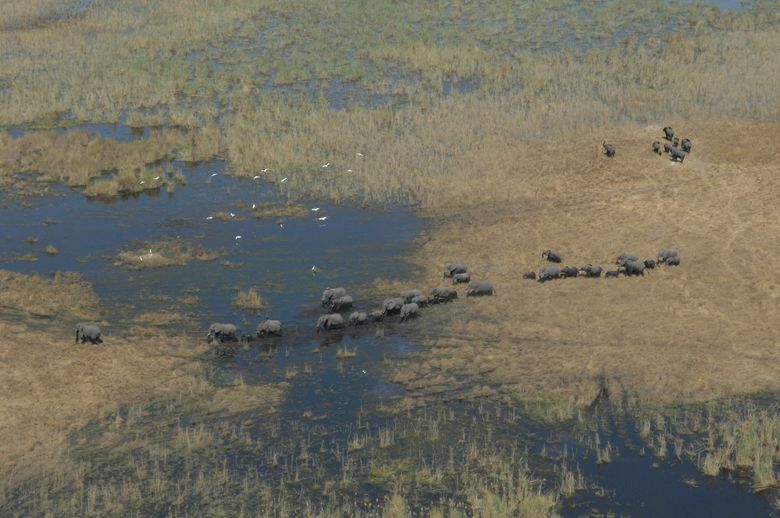 In Botswana, which is home to Africa’s largest elephant population, numbers held steady in many areas. And in a little-known park complex in Western Africa where the researchers expected to find perhaps 1,000 animals, they counted a thriving population of 9,000. The results were published Wednesday in the open-access journal PeerJ, and also presented at the International Union for the Conservation of Nature’s World Conservation Congress in Honolulu. University of Washington biologist Sam Wasser, who uses DNA analysis to track the origins of illegal ivory, said it’s crucial to shut down the ivory market, including an end to sales of ivory stockpiled in the past by African nations. Countries should also be forced to comply with a widely ignored requirement that all seized ivory be tested to determine where it came from, he said. Wasser’s DNA analyses provided some of the first hard evidence that Tanzania is the world’s elephant-poaching hot spot, accounting for almost 80 percent of Africa’s illegal ivory shipments. Tanzania was not happy with the revelations from Wasser’s research and the elephant census. The country tried to delay release of the census results. When the information was leaked, the government banned publication of unapproved data. But Tanzania’s new president is taking a harder stance against corruption and poaching, Chase said. Neighboring Kenya has also beefed up its park security and has been prosecuting high-level traffickers. As a result, elephant numbers appear to be ticking up slightly, Deutsch added. Experts from Vulcan are working with Kenyan parks to improve wildlife-monitoring and tracking systems. The Seattle group is also providing technical assistance for anti-trafficking investigations. In addition, Vulcan’s technological expertise helped with the difficult and tedious work of counting elephants, Chase said. Software engineers developed a new data-logging system that standardizes and automates data collection. Chase, a native of Botswana, met Paul Allen and his sister, Jody, in 2007 when they were on safari in the country’s Okavango Delta. Allen also owns Abu Camp, a resort where visitors can interact with rescued elephants. After hearing about Elephants Without Borders’ work, Allen asked how he could help. “I said: How can we begin to save a species when we don’t know how many we have?” Chase recalled. Skeptics dismissed a continentwide census as impossible and told Chase he was nuts. The field work was grueling — and occasionally dangerous. One district governor in Angola was convinced the surveyors were really looking for diamonds. “He said if he saw us flying over his territory, he would do all he could to shoot us down,” Chase said. Surveys were canceled in South Sudan and the Central African Republic, where conflicts are raging. The team hopes to cover those areas when it’s safe. Allen is also funding a new survey of forest-dwelling elephants, which can’t be counted from the air. Instead, workers on the ground tally dung piles. Another prong of Allen’s elephant-conservation strategy focuses on public attitudes. To that end, he bankrolled production of two films that will be released later this year: “The Ivory Game” documents undercover, anti-trafficking operations, and “Naledi: A Baby Elephant’s Tale” is the true story of an orphaned baby elephant at a wildlife-rehabilitation center in Botswana. China, the world’s biggest market for ivory, is among the target audiences, Chase said. “We’re hoping we can convince people in the Far East to change the way they view elephants and ivory,” he said.